Henry, I have posted several times over the last 15 years articles from OSHA/NIOSH tests that prove dual charcoal cannister painters masks ARE 100% effective in filtering out isocyanates while painting IF USED PROPERLY. They go on to say that the odor/smell of N-butyl acetate will come though the mask long before the mask leaches any isocyanates. Len is dead set on supplied air systems for breathing while painting and I have no problem with that. Air supplied systems are more idiot proof than dual cannister painters masks but again - supplied air systems are not idiot proof either and if not used properly can cause more damage than a poorly used dual cannister mask. I've been painting professionally for almost 50 years and I never worked in a shop that had a supplied air system. NONE of the professional painters I know personally in the last 50 years used or use a supplied air system. They ALL used/use dual cannister painters masks. I would guess that now more shops probably are using more fresh air systems around here but I have no proof of that. To bad mouth and cherry pick information about dual cannister masks is to me just wrong. They work fine and always have worked fine for shooting iso hardened paint -- if used properly. Show me (and all reading this) what mask manufacturer states a cartridge mask is acceptable to be used spraying paints with ISOSYANATES. You know, times and products are different now as I said previously. I SO wish you left what you said and my reply alone and let others just look things up. Post something from 3M stating what you said or any of the large companies that produce protective masks. Phil, new breed out there and if they want to stay involved for 10 - 50 years they should equip themselves with proper safety equipment. Thinking back to the early 80's I remember cartridge masks being used by guys in the paint booth but never saw any type of mask on the guys working and sanding body filter. The only warnings I remember back then were for the use of Imron. Imron was one of the first products on the market that produced very dangerous isocyanates which is in many activated paint products today. That is why a particle mask is good for body work but most paint spraying demands a supplied air breathing system. Stress kills faster then anything,keep stressing about this and you create your own problems. organic vapor cartridges do filter Isocyanate. how much ? definitely not 100% that is for sure. everyone talking about breathing, but nobody mentions skin contact. there are many ways to be poisoned by this stuff. and no imron was not the first to use Iso, that crap been used in foams and plastics long before auto paint. i got a 55 gallon drum of 100% pure iso sitting next to me and it is some nasty stuff. If you saw the result of people exposed to isos I think you might think differently. I know several people that were exposed once or twice and had to quit spraying paint. Stress related problems belong on a different forum. that's sound advice. you can absorb iso's everywhere on your body. the eyes are very vulnerable so be sure to use a full face mask. i cringe when i see those video clips of guys spraying with half masks. sets a really poor example. Yes you can be exposed through your skin or eyes but nothing is nearly as bad as breathing the isos. Cartridge masks help but because they are "negative pressure" it's easy to have contaminants leak into your lungs and most cartridges have a very limited life span. Supplied air systems are positive pressure and any leakage leaks out and not in and as long as the pumps are pumping air from a clean air environment you're breathing clean air. Good Grief, Henry ! We've been through this subject 100 times in the last 20 years on this site and I have posted direct quotes from gov't safety groups OSHA/NIOSH that say dual charcoal cannister painters masks are 100% effective in filtering out isocyanates for automotive painting WHEN THE MASKS ARE USED PROPERLY. The key part here is - WHEN USED PROPERLY. 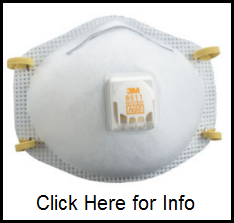 The reason 3M and other charcoal cannister paint respirator companies won't guarantee their mask to filter out 100% of iso's is for one reason and one reason only -- we live in a litigious society where law suits are all too common place and those companies paint mask are NOT IDIOT PROOF. And there ARE a lot of idiots out there who would intentionally misuse those masks then try to sue them to get money. It's also possible that the masks can be misused through ignorance about proper procedures using the masks. If you don't know what your doing spraying iso hardened paint, THEN DON'T DO IT. Pay someone else who does know what they're doing. Jake, your question has been asked several times before and it has triggered hours of heated debate. The bottom line to that debate (from my perspective) is that charcoal cannister painters masks ARE 100% effective in blocking out isocyanates will protect the lungs etc when spraying iso hardened paints WHEN THE MASKS ARE USED PROPERLY. The reason the charcoal cannister manufacturing companies don't recommend their masks for iso based paints is to cover their asses because their masks are not IDIOT PROOF. If the masks are not used properly either through intentional misuse or out of ignorance in how to properly use the masks that can lead to iso exposure by the idiot painter. Some basic rules in properly using dual charcoal painters masks (I have been using the 3-M disposable painters masks for 37 years and I have no symptoms of iso exposure related disease, which would be mainly asthma). The masks have to seal properly to the face - so no beards, go-tees, mutton chop sideburns etc etc. Mustaches are acceptible as long as they don't interfere with the mask sealing (some mustaches can be pretty outrageous). The charcoal cannister painters masks are good for about 8 hours of actual spraying time and must be stored in an air tight container between usages. The more concentrated the overspray is in the paint area the quicker the pre-filters will start to get clogged, so before any spraying sessions blow out the pre-filters with compressed air from the backside of the pre-filter. Or better yet keep some new replacement pre-filters on hand. While its true that iso's are odorless so the painter can't tell when or if the mask has reached its usable safe level and may be leaking iso's through the filters. There is a better way of telling when to throw the mask out. There is a chemical in paint called nbutyl acetate that does have an odor and it will leak through the charcoal cannisters long before any iso's do. Point being if you notice any chemcial smells coming through the masks filters then throw the mask out and replace it with a new mask. Make sure the mask fits properly too your face with the two straps properly adjusted to where they are not too tight or too loose. When you think you have the mask adjusted properly then put the palm of your hands over the air intake part of cannisters to block the air from coming into the mask and at that point try to breath in. If there is any air leaks around the mask it will show up at that point. after that check is successful then bend over so that the weight of the mask is trying to pull it away from your face. If it leaks air in around the mask then the straps are too loose and need to be tightened a little. My honest professional and personal experience tells me that you should be safe using a dual charcoal painters mask for painting one or two cars a year --- as long as you use the masks properly. There is no doubt in anyones mind that forced fresh air painters breathing apparatus with a fresh air hood is the best way to go when painting a car - also if properly used. If a person is in the hobby or business for the long haul then I suggest buying and using a fresh air system. For just one or two cars then the dual charcoal painters masks work fine when properly used. 1. 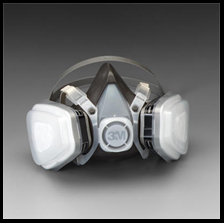 NIOSH recommends air-supplied respirators when there is the potential for exposure to isocyanates. However, if air-purifying respirators are used, there are a few items which should be noted. First, there are no NIOSH approved air purifying respirators for isocyanates primarily because isocyanates have no odor warning properties. Studies have shown that combination dust/mist and organic cartridges ----- effectively stop isocyanates and that the various solvents will break through long before any isocyanate --------------. Therefore, the odor property of n-butyl acetate could be used to determine when respirators need to be replaced. Eye and skin protection should be provided during spray painting. (end quote). Wow this is an informative thread. I’m a noob and definitely need to know the risks. What I got from the discussion is I should have a fresh air supplied system with a full face mask when painting in my 26x26 garage with 10’ ceiling and minimal ventilation. There are several ways of protecting yourself depending on what you're protecting yourself from. If you're sanding on body filler or a coating and you only need to protect yourself from dust then a low cost dust mask may work but if you have a beard you my want more protection. 1. A cartridge mask has a very limited lifespan and may not remove harmful chemicals after a short time. 2. A cartridge mask works on negative pressure and any small leak around the edge can expose your lungs to potential problems. 3. A supplied air system should have a hose long enough so that the pump can be placed in a clean environment while you spray. 4. If you're only spraying one or two vehicles you can probably sell a supplied air system for more than half of what you paid for it. A good quality cartridge mask is acceptable for 8 (that's eight hours) of exposure to any air. That's why they manufacture that plastic cover over the inside where you breathe from. Supplied AIR is the PROPER way to go unless you can't afford to own one. That said, SUPPLIED AIR also protects your eyes and facial skin. Remember, ISO chemicals go after moist, damp wet parts of the body. i just couldn't justify the cost of the supplied air system with the small amount of hardened paints i spray these days. i won't dispute the value of that system though, and i'd have it if i had the extra dough. but i do have a full face cartridge mask, and whenever i spray paint with iso's i put new cartridges on. be sure to check the seal by putting your hand over the intake and inhale. you'll find out right away if there's a leak. or if you smell paint there's a leak. i believe it's safe enough for the painting environment i'm in. i have "reasonable" air exchange.